James Lambert pointing at the Union Jack on his helmet should make it painfully clear what to expect from the competition. The imperialist ambitions of the United Kingdom used to be expressed through colonisation of half of the known world and a complete exploitation of everything it had and it did not have to offer. Nowadays, this behaviour being virtually impossible due to the pressure from the part of the UN and NATO, the British decided to conquer the world of sports. Unfortunately, their plans are usually ruined by different countries, depending on what discipline Britain tries to compete in. In cricket the country is beaten by South Africa, in soccer by Italy and in ice hockey by most of the known countries, whether Northern or Southern. Such losses on multiple fronts have urged England to create several entirely new sports disciplines, which only the British would know how to compete at, notably "unsuccessful ski jumping". Unsuccessful ski jumping is roughly the same as the usual ski jumping with the only difference being the fact that British ski jumpers have, since the dawn of sports, been trained to fail. ~ Eddie The Eagle on his jumping abilities. Eddie is more than an eagle, he's the Superman of ski jumping (and sky-diving). The program was introduced in the late 80's. The first ski jumper prepared to compete in this new discipline was Eddie Edwards, soon nicknamed "Eddie The Eagle", due mainly to the fact that he always spread his arms as well as skipoles like an eagle's wings, when he felt he was falling (which was quite often). Eddie Edwards began his career as an unsuccessful skier, whose lifegoal was to win the Olympic Games in Calgary. What made his goal difficult to realize was that he failed to qualify to enter them as an alpine skier. Nevertheless, the British Federation soon became aware of the potential the young man was carrying and enlisted him as a ski jumper, without bothering explaining him what ski jumping was. Eddie, who was also extremely short-sighted (physically, as well as intellectually), agreed and began his training. His coach was a typical Brit, who skijumped whenever he was sober and jumped from windows whenever less so. The training resulted in a series of severe injuries, for both the disciple and the master, who soon became the former's preferred landing platform. Happily Eddie recovered before the Olympics and could compete with the best ski jumpers of his era. In his Olympic debut, Eddie lived up to everyone's expectations, placing last in both the 70m and 90m events. This earned him massive attention from the media, as supporters soon grew to love his abnormal appearance. Nowadays, for instance, few remember the winners of the Calgary games but nearly all sports fans know who came last. Eddie the Eagle, seen here spreading both his arms and his skis. 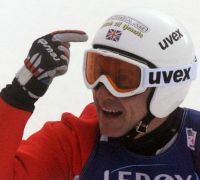 In fact, Eddie became so popular, that fearing the repetition of the "Eddie "The Eagle" phenomenon", the British Federation soon introduced the "Eddie "The Eagle"" rule, which disqualified from international games anyone who happened to be called Michael Edwards, as well as sportsmen whose performance was any similar to his own. Willing to bring his failures onto the screen, Eddie started visting talkshows, but - being a gifted speaker as much as he was a gifted skier - he soon decided to return to his former work as a plasterer. The only difference was that now he didn't have to reside at a mental hospital, where he had previously placed himself due to an acute lack of resources (financial and otherwise). Still, one way or another, the imperialistic ambitions of United Kingdom were - for once - fully satisfied. Even the failure-supporting program has its fails, however, and Glynn Pedersen is one of them. Meant to repeat the least successful performances of Eddie The Eagle, he was unfortunately a decent ski jumper, who would occasionally find himself in the top 30 of a relatively unknown sports competition. This ended his sponsorship and ruined his career. James Lambert has been the third and (so far) the last British attempt to conquer the world of sports with unsuccessful athletes. An amateur ski jumper, he didn't compete before the age of 45, when he finally claimed he was ready to face professional challenges. During the 2011 FIS World Ski Championships in Oslo, Eddie the Eagle Rule prevented him from joining the ski-jumpers. 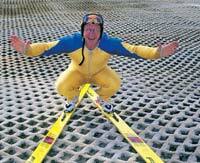 But a man of solutions that Lambert was, he quickly decided to make a debut as a nordic combined skier. This seemed an even easier discipline to be worse at, especially knowing that Lambert knew neither how to jump, nor how to run. He took part in a 90m competition and came last, as everybody predicted, losing half of the distance to the penultimate athlete, mainly because he jumped when he was supoosed to run and ended in a pile of snow. On the course, he performed even worse, being overlapped after somewhat less than a kilometer. This Hungarian ski jumper's life might as well end at the same time as his career. Everything would be going fine for the British Federation, if it was not for a serious rivalry with Hungary, whose ski jumpers are so unsuccessful that they are even unheard of by most of the Hungarians themselves. Though, unfortunately for the Hungarians, who are more used to fighting off Soviet tanks than to ski-jumping, this also means Britain can claim the monopoly in the field of unsuccessful skiing, without the fear of being contested by the Hungarian population. Hungary is perhaps the most notable example of failure turning on itself and of a loser scoring second in the losers' competition. This page was last edited on 1 January 2016, at 00:18.